This is a guest post from Selma Lisam, who is one of our community’s star members and learners. Selma is from Algeria. Her goal is to earn a PHD degree in Neurolinguistics in the United States. She is studying science of the English language. She’s been studying English for 16 years. In her free time, she enjoys practicing Karate, spending time with her family, shopping and traveling. English is a compulsory subject in secondary school in my country, so my English learning began from my very first day of school. Learning English has a lot of benefits in my country: it can provide you with a better job if you speak English fluently. 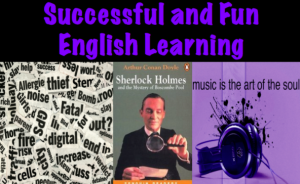 It can let you gain more and more knowledge for studying English. English is a common language and you can use it to become an international citizen. So, learning English is a good way to communicate to foreigners. Besides, many companies need good office employees to do international business. Back in 2004, I was an average English student. I had problems with basic grammar and my pronunciation was bad. I had been in English classes for several years, but I still wasn’t satisfied with my progress. I realized I needed to start learning the language on my own. Up until then, my main language activities were memorizing lists of words and doing grammar exercises. Of course we also did some reading and listening in class. The problem was that most of the time the topics were boring and I wasn’t really keen on hearing about them. From time to time we would play a game. But most of the games had one purpose – to get us to learn a list of words. They were no fun, either. After a few years of English classes I knew some more or less useful vocabulary and a couple of grammar rules. But I could hardly speak and made lots of mistakes in my writing. I decided to start reading in English. I began with simplified books from the Penguin Readers series, which helped me to increase my vocabulary. I noted each new word in a notebook and I was explaining them using the Robert dictionary. My vocabulary was growing quickly, but my English was still very poor. My writing had improved a bit, but I still had problems with listening and speaking. I listened to English songs a lot, but I couldn’t understand the words. So, I downloaded lyrics of my favourite songs and learned them. Gradually my listening skills began to improve. Moreover, I was chatting on the internet with my friends in English, so this has also helped me a lot. I can’t say yet that I speak English because I don’t speak it very well, by far but I’m trying and would love to speak it fluently one day. Actually, learning English is an ongoing process, and I am still learning. Really awesome post, Selma! It’s really cool to read your story. You’re a model learner. Great article Selma! I love the fact that music has been a significant part of your English learning. Listening to Brazilian songs has also been a huge part of my Portuguese learning. Thanks for sharing! Awesome article Selma. I love it when you share with us many interesting sites and programs to make our process of learning a lot more fun. The fact that your goal is to earn a PhD in Neurolinguistics really fascinated me. Good luck! Very good post! I actually try improve my english too and sometimes I feel like my english is not impriving like I would like. this tips was very good to me. Wow,,,, you did it very well, I like your process in studied English..
my problems are like yours listening and spoken speech and same solutions but weak success. Oh that’s amazing , Selma this is great method to learn English . By the way I’m from Algeria too ,and by the way i don’t have friends who i can chat with them in English really so what should i do ?